The Armstrong Model 414LE central air conditioner is the company’s mid-level unit that offers a great combination of lower price and good efficiency. It’s a popular choice for homeowners in all climates and offers the best value in moderate or mild climates where there isn’t as great a need for higher efficiency models. Reed in Janesville, Wisconsin offers this HVAC prices submission with his Armstrong Model 414LE 14 SEER central air conditioner price. “We bought a fixer-upper here from the bank last fall and spent a few months doing the repairs. I’m not sure if we’ll live in it long-term, try to sell it, or rent it out at some point until the economy improves. I started by gathering just central air conditioner prices but upon further inspection realized the whole system should be replaced. I started poking around on this site and others to find a good system. I wanted a reliable and efficient system especially if we keep the house, and I wanted an inexpensive system especially if I sell it. The Armstrong 414LE and matching Armstrong 90% AFUE gas furnace seemed to fit – it’s rated high for quality, has decent efficiency and was more affordable than units I priced from Ruud, Carrier and Lennox. It’s not especially fancy – but from the HVAC reviews I’ve read it seems to offer good reliability and durability. Up to 14 SEER, Energy Star Rated. Should reduce energy use by 15% to 40% over older models it replaces. Eligible for the federal tax credit when installed as part of a qualifying system. Efficient single-stage compressor is made quieter with an insulation blanket. Uses environmentally safer R-410A refrigerant. Drain pans treated with Microban to inhibit mold and fungus growth. Steel cabinet and steel louvered side panels maximize protection while offering good air flow. Onboard diagnostics and fault-code storage for quicker re-sets and maintenance/repair. While Reed clearly has good DIY skills he knew his limitations and let a qualified contractor install his new system. This is the best way to ensure the highest performance and efficiency the system is capable of. It is also the best means of keeping your family and your home safe. Improper installation can lead to faulty wiring fires or even gas or carbon monoxide leaks, and those possibilities simply are not worth the risk. 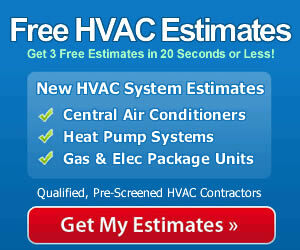 Hire the pros and have the peace of mind you are getting safe, efficient performance from your system.